The NgForOf/ NgFor directive instantiates a template once per item from an iterable and the context for each instantiated template inherits from the outer context with the given loop variable set to the current item from the iterable. 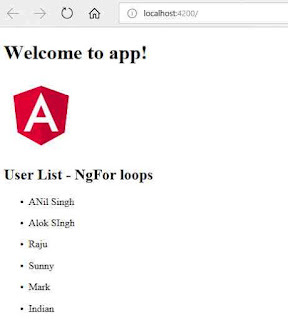 NgForOf with HTML Elements - The NgForOf directive is used with HTML elements as following. NgForOf with <ng-template> - The NgForOf directive is used with <ng-template> as following.